Regiment/Catrawd: 13th Battalion, Royal Welsh Fusiliers. 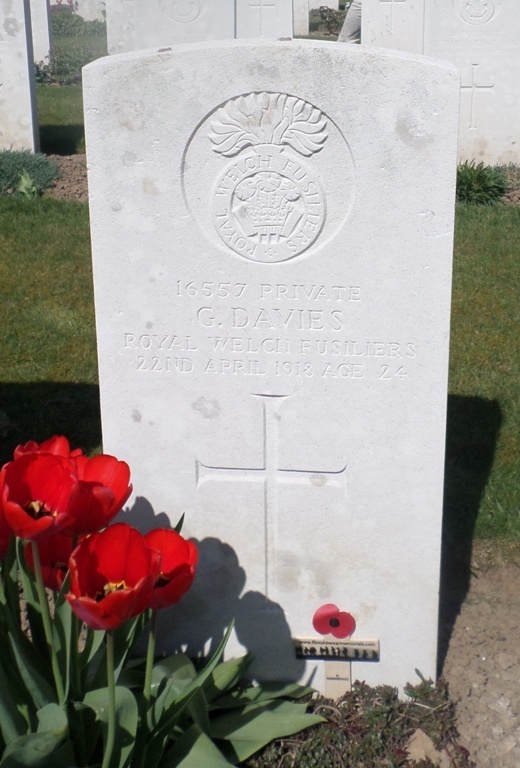 Service Rank and Number / Rheng gwasanaeth a rhif: Private No. 16557. Military Cemetery/Memorial / Fynwent milwrol: Bouzincourt Ridge Cemetery, Albert, Somme. Ref No Grave or Memorial / Rhif cyfeirnod bedd: Plot: 11. Row: A. Grave:11. Killed in action on 22nd April 1918 during the Battle of Albert, Somme, aged 24 years. Geoffrey Davies was born in Crewe, Cheshire on 12 December 1893. The 1911 Census shows that the family lived at 71 West Street, Crewe, Cheshire. The head of the family was David Davies aged 58, a Bank Manager. David’s wife Sophia Anna Davies had died some years previously. There were four (4) children living at home – Laura Elizabeth Davies aged 23, David Davies aged 21, who was employed as a Railway Clerk at Crewe Railway Station, Geoffrey Davies aged 17, a Student and Margaret Davies aged 13 years. Also living there at that time was Alice Maud Clements aged 21, who was employed by Mr Davies as a General Domestic Servant. Sometime after 1911 the family relocated to North Wales and lived at 22 Sandringham Avenue, Rhyl, Flintshire. Nothing is known of Geoffrey until in 1915 he enlists with 13th Battalion, Royal Welsh Fusiliers at Rhyl Drill Hall. He disembarks at Boulogne with the Battalion on 1 December 1915. Photograph taken on Sunday 9 April 2017 by Geoffrey Mitchell who placed a British Legion Wooden Remembrance Cross on Geoffrey’s grave on behalf of Flintshire War Memorials. 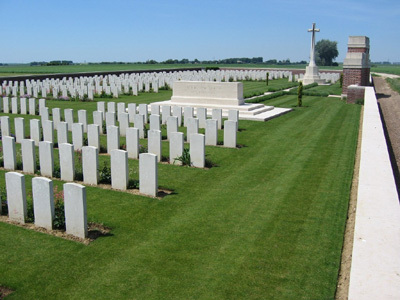 Bouzincourt Ridge Cemetery, Albert, Somme, France. On 3 September 1918, a payment of £13.3s.3d was made by the War Office to David Davies, this being monies owed to his son Geoffrey. On 10 December 1919, a further payment which is recorded as a War Gratuity of £16.0s 0d was also made to him. 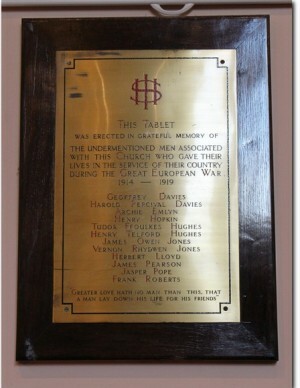 Geoffrey is also remembered on a Remembrance plaque at The Royal Alexandra Hospital, Marine Drive, Rhyl, Flintshire and Christ Church, Rhyl, Flintshire and The North Wales Heroes Memorial Arch, Deiniol Road, Bangor, North Wales. There ia a Flintshire Roll of Honour Card for Geoffrey Davies at the County Archives Office, Hawarden dated 18 September 1919, which was completed and signed by Mr David Davies.